Of all the things we saw while we were in the UK, Dunnotar Castle has to be my favourite. Don’t get me wrong; Stonehenge was beyond amazing, and something I’d longed to see most of my life. But never in my wildest dreams would I have imagined visiting a place like Dunnotar Castle (perhaps partly because I didn’t know it existed). Scotland is fairly famous for its castles. One of our group even commented that he would have been disappointed had we not visited a castle while we were in Scotland. If you can only pick one, I highly recommend this one. No that’s not photoshopped(though the aforementioned member of our group joked that no one would believe us). I am clutching my husband for dear life in fear the wind would blow me over the edge of that drop. And behind us are the remains of Dunnotar Castle. It’s quite a walk to reach the ruins. You have to go down a bunch of steps and then up some (it’s much harder in the other direction). It’s easy to understand why someone wanted to build a castle at this location. You can just imagine trying to ride a horse to the entrance, or how difficult it would be to lay siege to a castle surrounded on almost all sides by sheer drops. And check out this view! I would very much love to see what it looked like when it was new. Passing through the gate, we purchased our tickets and guide book. Then we had our pick of the ruins. They were more extensive than any other castle we had visited. Beneath the castle proper are the remains of the kitchen, brewery and even the cell in which thieves would have been thrown. 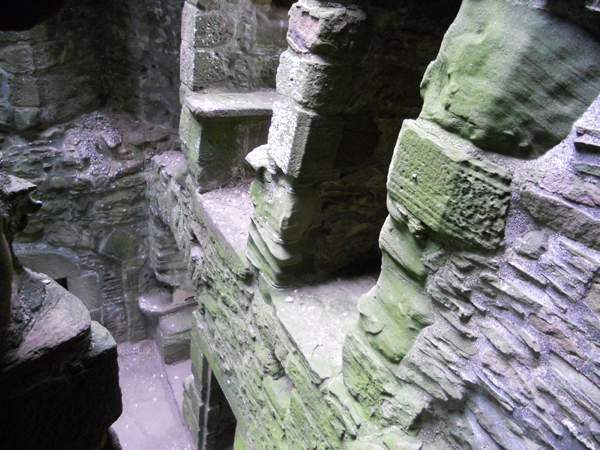 Above are the remains of the suites where the Lords and Ladies of the castle dwelt. 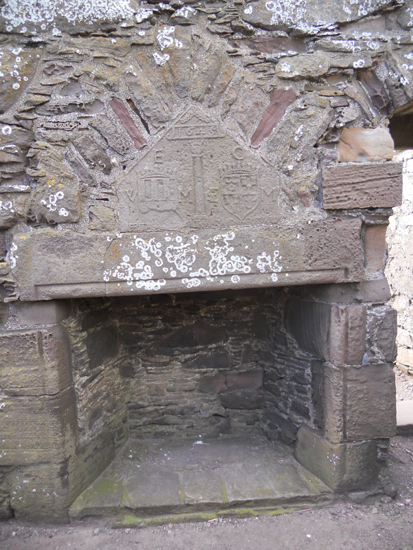 Most amazing to me are the remains of the family crests, still etched into the stone above the hearth. There was also sundial in one room, across from a window. It was easy to imagine sitting in a chair beside the fire and glancing up to check the time. Posted on the walls of the ruins are stories of its history. It seems the Honours of Scotland (that is the crown jewels) were once housed at Dunnotar Castle. When England decided to eradicate the royal line of Scotland, they wished to cement their rule by destroying the honours. 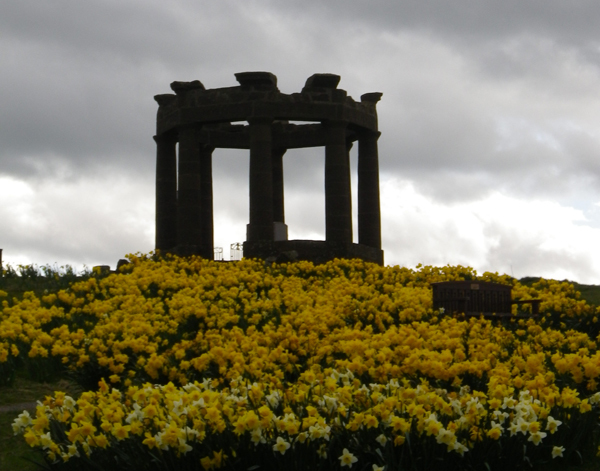 However, the cunning ladies of Dunnotar Castle smuggled the honours from the grounds when the English came for them and they were later recovered. Ironically enough, though the Honours of Scotland have survived, the original English crown jewels were destroyed and new set had to be commissioned; those are still in use today. 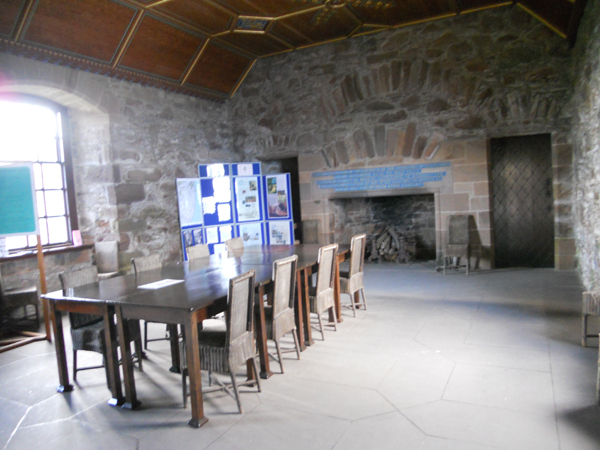 Perhaps my favourite part of Dunnotar was the drawing room, which has been restored to period accuracy. As with most places in Scotland, the wind howls through the mountain tops in the rest of the ruins, but it’s quiet and warm inside the restored building. No fire burns in the hearth, but it’s easy to imagine one. There are straw chairs and a solid wooden table, as well as a colourful ceiling. Needless to say, this only increased my desire to see the entire castle restored. 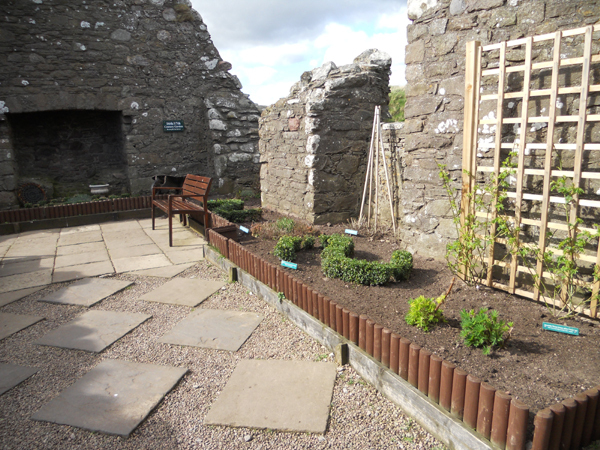 Back in the courtyard there’s a replica 16th/17th century garden to be enjoyed. We tend to think of castles as the dwellings of Kings and Queens, but they tend to be made up of many smaller buildings as well. Dunnotar had plenty to visit. Including the smithy, stables and a guard tower. Awed by our experience, we reluctantly headed back toward the parking lot. But not before we walked down to the loch to stick our fingers in the water, just because we could. About half an hour walk from the castle stands a monument. Uncertain what it was, and wanting to check it out, we decided to make the hike. 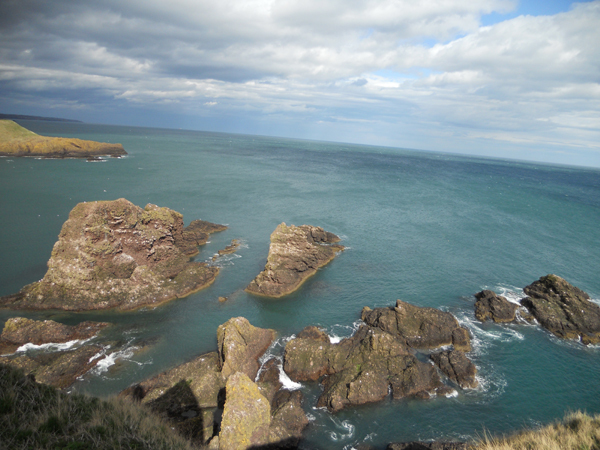 The path wound around the edge of the high cliffs, with fields as far as the eye could see on our other side. People from the nearby town bring their dogs to this place to run, and you can certainly understand why. The monument turned out to be a war memorial, and a spectacular one at that. The shape and location certainly inspired my muse to work overtime between the walk to and from. We piled back into our van and continued the drive to Aberdeen, but we all agreed the experience would stay with us a long time. Great pictures! I love the detail you put into the post. Made me want to visit!